Michael Aspel and the team examine antiques in Bridgend. Fascinating finds include a Victorian Welsh hat, a bow-fronted barometer and a valuable whale's tooth. Browse content similar to Bridgend. Check below for episodes and series from the same categories and more! of a welcome in the hillside. a thriving town in Mid Glamorgan halfway between Cardiff and Swansea. The Welsh version of the town's name is Penybont-ar-Ogwr. The Ogwr being the river that flows under this 15th-century bridge. Above Bridgend is one of a trio of fortresses the Normans erected to protect their border from the Welsh. who besieged all three river crossings and did particular damage to this one - Newcastle. Famous sons of Bridgend have been a diverse band of achievers. There was Dr Richard Price, known as the father of life assurance. many years before the official discovery in Germany. who, probably more than anyone, made the world aware of Welsh culture. by people fleeing from deprivation and poverty in Northern Italy. a spirit of enterprise and their cooking skills. Boys sold custard ice cream from handcarts and the newcomers set up cafes with a welcoming atmosphere. By the 1930s, there were more than 300 Italian cafes in Wales. Most of them are still here - an indispensable part of the community. Salute. where it's roasted and delivered to the trattorias, bringing a taste of la dolce vita to the Land of Song. she always said that she remembers playing with it as a child with her governess. -That explains some of the subsidence and structural damage. The whole house is slightly ropey. Let's turn it round. A fraction of the roof is missing and we've got cracks all the way round. And some repairs. Well, I'm going to put that to one side. Now, do you know the family names of the lady who originally owned this? Er, she was a Miss Jones, daughter of a Reverend Jones. What I really wanted you to say that she was "Miss Teapot"
Because that presumably is what the original artist - when painting the model - was referring to. I think she must've been Miss Kettle. This was done in 1833. This is a pastille burner. -special ways of making the atmosphere smell sweetly afterwards. And they'd have a pastille burner. Usually they are about this size. This is the biggest cottage pastille burner I've ever seen. There would have been something in the middle...? and usually through the chimneys. It was almost certainly made in Staffordshire. This is pearl ware, bluey glazed pearl ware. -simply to say, "Have you seen a bigger one?" Well, it is such a rare object. That was the unmistakable sound of a slightly distressed disc musical box. Now, tell me your family relationship with it. It was given to me about five years ago by an elderly neighbour and it was his grandfather's before him. -Oh, lovely! So it had been something much treasured in his family. to make it look like rosewood, it isn't actually rosewood. a German company that made a lot of these disc musical boxes and, in date, between about 1900 and 1910. But what that makes it special is the bit that I'm hiding here...this. into something much more entertaining - an automaton. Let's just get it going. -Oh, it's great, isn't it? but this puts it into a completely different price category. between about £1,000 and £1,500. My husband bought it for me in 1960 as a wedding anniversary present. -I was moaning I didn't have a desk and he did. -Well, you have a desk! -then, when it's turned over, I could darn his socks. Well, if you open it, I have no doubt that we have a sewing compartment inside. These writing desks, are really little bit of English social history. and they were really conceived for officers and their families when travelling abroad. so it's at the further end of the history of this sort of campaign writing tables. -They were used when people were living under canvas. They tried to have as many home comforts as they could. a little inkwell, something to probably hold quill pens. On the reverse, you have compartments for your sewing equipment. and they specialised in this sort of furniture and this is going to be made by one of those makers. It's a very nice. Are we able to discuss prices if this was...? -It was bought in 1960 from an antique shop in Cardiff. It wouldn't have cost an awful lot, I would have thought probably about £10 to £15. But it was 1960. -so I would put a valuation of nearer £1,000 on it. It belonged to my great-great-great grandfather, who was a member of the Royal College of Surgeons. where General Packenham was killed. and he was serving at the time in Corfu. Right. Oh, well, that's lovely to have all that background. and this type of tunic, it's known as a long-tailed coatee. And here we... here we see the reason for it. In the period that you mentioned, when he was in the Peninsula War, he wouldn't have worn this tunic. and then after the Napoleonic Wars, this type of tunic was adopted. In fact, it went on to 1855.
was the severe winter in the Crimea in 1854-55.
so this coatee, as I say, had a life up until 1855. But I would place this... I believe you said, didn't you? 1825. Well, 1825-30, around that time. Has he got anything in his pocket? -Did you know there was a pocket there? No. You never know, I might have found a sovereign! Anyway, these coatees do not survive, there are so few about. and to be in the same family, this is wonderful. I feel that it would fetch something in the region of £1,500. -I thought it was a couple of hundred pounds. -Oh, well, then, that's good news. This is what we ought to see - Welsh Pottery, made by Dylan and Co.
And are all the pieces coming out - are these all going to be Welsh? This is marked Nantgarw which is nice to see, should be incredibly white. It is very white when you hold it up to the light. -It's also very heavily potted. -That's a nice one, I think. -So, you've got a complete mixture. You've got pottery from Swansea, porcelain from Swansea, Nantgarw. -Which of these is your favourite? -Yeah, I like this one, too. Probably made sometime around the 1830s with a ship that is somewhat older. It's probably 30 or 40 years out of date, but it's a lovely thing. -so at auction, you might be lucky to get as much as £100 for it. -We've had the magnifying glass on it. And everybody thought, "We know about antiques..." Nobody knows. -And I didn't have to look at the signature. -Well, I asked you to. -Because I knew exactly who it was by. Basically, he's a painter around the turn of the century and later. a woven tapestry of colour in a way. That's right, which amazed me, it being so old, that it still has that richness of colour in. All the richness of the reds and the blues is there. -I think it's worth £2,500 to £3,500, maybe a bit more. -..on a good day, up to £5,000. -But I would say £2,500 to £3,500 seems like a reasonable valuation. -Excellent! Thank you very much. It was my grandmother's and it came down to me when she died. and you went out with your jug and the milk poured in from a measure. -Oh, yes, so this was the jug? -So it was in daily use. There's a mark on the bottom which is a GB. Does that mean anything to you? -and Barnsley is just down the road. Well, in that case it must have been bought in that area. In the 1920s, Wedgwood was an avant-garde firm. working under the guidance of artists like Millicent Taplin who were in charge of the hand-decorating girls. -because of the Barnsley connection. Now, do you think it has any value? -No, I wouldn't think so. I've often seen silk merchants' sample books with prices in, but this one is extremely strange. but actually notices here of all the things that you do to make it. -I think my great-great grandfather was a silk merchant in Spital Square, London. I think it was probably about the 1840s or something like that. He probably started the business. I acquired it from my father when he died and it's been in the family as far as I know ever since. I love this. This is so bright. It's been in this book, this book dates from about 1850, I would have said. and then to see it actually made up into these tiny little samples. And, as I was saying, the unusual thing is he tells you how to make it. "Systeme de la mechanique a la Jacquard," and here it all is. -It's the famous loom, isn't it? -Yes. It's unusual to see how to do this. but I can't see that in the mid-19th century that everybody would have known how to make this sort of silk. would be fascinated to have it and to see what's going on in here. -I've had it about 45 years. -And I acquired it then. -I used to use it in my younger days. But haven't used it for years. I've just kept it in the drawer. -But you never considered that it was unusual? and they were called the Luxus range. Luxus meant that they were a very luxurious camera. They were finished with snakeskin. because one of those some years ago sold for £30,000 at auction. Now, what is very interesting about this is that it's got a pretty early serial number, 88840. Now, that to me, is a Leica Two. That is 1932 for this particular model. -and I have to be quite frank with you, I've never seen one with a gilded body like this. That makes this a particularly interesting camera. These cameras are faked a great deal. I've seen some very good fakes in Eastern Europe. and if someone was faking a camera, they wouldn't go to the trouble of producing all this wear on it. which is generally square, but the real ones have a circular sprocket. And if I look inside it, it has a circular sprocket, we can see that. So there is no doubt in my mind that this camera is absolutely correct in every respect. It's difficult for me to put a price on this because Leica collectors, they're a law unto themselves. They look for things that are interesting and different. -but I think I can tentatively put an auction price of £3,000 to £5,000 on this camera. -I would hope that it would do that and better. I didn't realise it was worth that. Well, if only these artefacts could talk. Is this something that's been in your family? Yes, it's been passed down several generations. -It is a box of tricks when you open it up, isn't it? -It must have been all over the world, I suppose. This is something that every grand gentleman or lady would perhaps take around with them. -..from my gran's mum's brother. -And even little silver mounts on the leather writing slide. -Really quite magnificent, the way it's put together. -I mean, it is a myriad of objects in here, isn't it? And they've got absolutely something for every occasion, but mostly for personal hygiene I suppose, isn't it? -Um, wonderful glass and silver bottles, silver mounted. because it has scent at one end and cologne at the other. You can unscrew the cap. -so that everything is airtight. It's hallmarked. It's 1886 so getting on for 115 years old, aren't we? -It needs obviously to be liquid tight. -because there's so much amongst the objects. who might cry out just for that. -One would be expecting, I suppose, probably £300 somebody might pay for that. -Just for the one bottle? -They are particularly sought after. probably estimate something in the region of £1,500 - £2,000. -Quite a... quite a grouping of things. Well, these are by Allen Jones and you knew him? Absolutely, yes, I met him in London in 1959. I was a neighbour of Allen's and then we became friends. Good, and this was done, I assume, when he was at Hornsea. -Studying with Alan Braund. Do you like this print? and that's how he could see his garden through his window. -Interesting, because I wouldn't look at it that way. -I just feel this great vortex of wind. -The face is part of the garden in a way. So, he goes from Hornsea School of Art, where this was painted, to the Royal College. -This is a Royal College picture? the strongest and most popular form of communication, which in a way is the poster. What do you think of it? I think it just jumps out at you, as you said. It's a poster, isn't it? It's so different, and I just think it's wonderful. I just love that. How do you translate this? Or you don't? -I've always assumed that was Allen's face. -Right. Could be anything, couldn't it? -I think it's Allen's face. -Do you? I think it's a rhythm of bodies. -No, I think it's Allen's face. So there you go. Anyway, it's wonderful. but a poster like this is only worth £300 or £400. You can buy an Allen Jones, so I think it's a wonderful area to buy. A great Allen Jones, for instance, is only £4,000. -And I'm sure it's not going to last, but here is a wonderful area. but they would be just a few hundred pounds if you did. It's exciting. -What does it say on the top here? -I'm not very good at reading Welsh. "Tarian Goffa Iorwerth Glyndwr John." A shield in memory of Iorwerth Glyndwr John. -Where does it come from originally? This is the first copy of the original shield that was found in the Thames a long, long time ago. And they used it for the Eisteddfod prizegiving. and the choir that he was with won the National Eisteddfod four times in six years. -Ah! And this is the arts we're talking about? -so it's back hanging up again. because it deserves to be hanging. who took over Jesse Ramsden's business in 1800.
and the premises was in Piccadilly and this man died in 1819.
and, on these canted corners here, little ebony inlays. It is as good as you will find. So for a barometer just after 1800, what sort of figure do you reckon? and these bow-fronted stick barometers have zoomed over the last five years on the market. and would retail with a barometer specialist probably around £12,000. When I was a little girl, if I was very good, I was allowed to wear this on St David's Day. -It's been in my grandmother's family, I don't know how long for. -This is quite an early one, isn't it? Your grandmother's family? It's a very traditional style and certainly like a Victorian one. -Any idea about their value? even in this condition. It could be as much as £600 or £800. -No, no. They're very rare things to find. I believe it's made of oak. -originally from the west of England. -It is, in fact, true ebony. It's a very dense wood and that accounts for its weight. Have you any idea where it was made? as being from the time of Charles II. In fact, we now know differently. and some of them date to the 19th century. This one, I am sure, is an 18th-century example. the way the flowers are done, the way the leaves are carved. And these heads - although they're trying to depict Western figures, they've got an Oriental feel to them. And so these are carved by people in the East trying to imitate the look of Western figures. so it's quite understandable why people believed them to be that. -Is it something you've had valued or given any thought to? -I really should find out more about it. One's probably looking at a figure of something like £5,000 for one chair. It's a very, very good example. This is Welsh porcelain as good as it comes. Are you a collector? I am. My wife and I have been collecting for 20 years. And these are choice pieces indeed. one feels the factory is struggling because it's got no gold edge. -I was attracted to that one purely for the decoration - very elegant. I'm looking at these flowers here and see the hand of William Billingsley. -Had you thought about the artist? -But attributing the artists is tricky. What matters is the style which is so classic. so decorated at the factory, but never finished off. -but that gives a lightness which is really wonderful. And two pieces, though with very different decoration, from Nantgarw. a lot of it so beautiful, they sent it to London for painting. And here we've got London decoration at its best. What is that? A Virginia quail, I believe. and one can just see the mark tucked in there - Nantgarw CW - China Works. -Every inch of it smothered. -All those flowers - they're so real. -Yes. Many hours gone into that. and that gold is all done by hand. It looks so perfect. How on earth can anyone do that quality? So we know that they're good, quite expensive pieces too. -Do you know much about their values? You bought them recently? They were bought between 8 and 10 years ago from a dealer in Swansea. because people do realise how good they are. -This is nice being Swansea decorated, although the lack of gold will reduce the value a little. -Where do you get a better one than that? is inscribed - not signed, in my opinion, but inscribed - Lancret. Now, tell me what you feel about the drawing and a little bit about it. Well, the...drawing has been in my possession for 40 years or so. It was given to me by my father, who took it from a portfolio given to him by his brother, an art dealer. -but what I'd like to know is who actually did it. I'm not absolutely convinced I'm going to be able to tell you. or whether it could be French and I think that is one of the things that we must consider. but really...the style of Lancret is much more sophisticated. which doesn't appear in this drawing. so perhaps it's not, after all, by an absolutely top-flight artist. but he was a few years earlier, and he did numerous portrait drawings. there is a suspicion of a watermark - a shield. but I suspect that it's a Dutch paper which both the French and the English would have used, anyway! but probably wouldn't have indicated who did the drawing. the value, I'm afraid, will be much less than if it was by Lancret. -around £1,500 to £2,000 would be a fair figure for it. This belongs to a club I'm a member of. -I would think within ten years of its founding. "Killed by the Harriet's jovial crew. "My body is in the barrels bound, My teeth exposed to view. "My race 'tis true have often died And cherished many a sinner. "My flesh was partly boiled and fried And made a Christmas dinner." The last two lines are...appropriate to what's caught on Christmas Eve! -First of all, it's a sperm whale tooth, but you knew that. a real sort of adventurer's type of ship. it was the prime energy source for the home. was built in 1810 and was registered in New York. but they put restrictions on whale oil coming from American whalers. So what did the American whalers do? "South Seaman" and the captain, James Jones. The other interesting thing here is the date - 1821. It's very, very early for a tooth to be dated 1821. -and it's very unusual to have anything dated from before that. and, I have to say, historically important - piece of scrimshaw here. What's it going to be worth? that this was off the coast of Chile in 1821, but why disbelieve it? -Goodness gracious! I know they all say that, but we thought £2,000. -Now, how did you look it up? -It's got a sign underneath that I thought was important. -So what did you find out? -I can't tell you anything about this. -OK, I'm going to ask you to pronounce what that stands for. which, if you'll forgive my Dutch, is Verenigde Oostindische Compagnie. -The United East India Company. guns even carried the same insignia, it was a very important monogram. -How did it get to you? and I said, "Fine, I'll keep it." It's sat on my bookcase ever since. -What's the maximum you've ever paid for a piece of Denby ware? -So this is an also-ran. -It was £4 for the box, yeah. -So anything I tell you that this is worth will be...a plus? and then this decoration along the edge is called octopus scroll or caracusa scroll. -and you've got chipping around the sides. I couldn't - I'd no idea. -OK, well this dates to about 1680 or 1690. -Wow! My grandsons will have their new surfboards! Pretty well the whole of Bridgend came to the Roadshow. It's been an astonishing turnout. Thanks to everyone for showing us their treasures and for letting us share their memories. 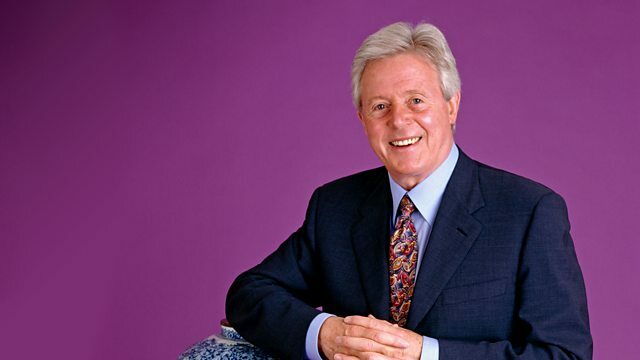 Michael Aspel and a team of experts invite members of the public to bring along their antiques for examination. Fascinating finds include several plates from the Nant Gawr and Swansea potteries, a Victorian Welsh hat, a high-quality, bow-fronted barometer and a valuable whale's tooth.